Television replays are needed in football as players are more "deceitful than ever", says former Premier League referee Graham Poll. Fifa president Sepp Blatter is keen to bring in a system allowing managers to challenge a decision using video. "It's a great idea," Poll told BBC Radio 5 live. "The game has speeded up. "Players are more crafty and deceitful than they have ever been. Unfortunately, that is a fact of life, therefore referees do need help." Blatter's idea would give managers at least one "call" per half to contest a referee's decision, but only when there was a stop in play. The system, which is used in American football, could be trialled at the 2015 Fifa Under-20 World Cup in New Zealand. 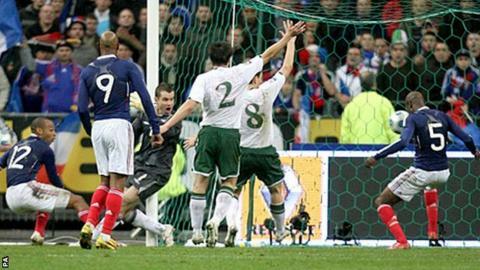 Poll highlighted former France striker Thierry Henry's handball against the Republic of Ireland in a World Cup play-off in 2009 as the type of incident for which video challenges could be used. Henry handled the ball before crossing for William Gallas to score an equaliser in the second leg as France went through 2-1 on aggregate. "Everyone who watches a game on the television knows within seconds when a clear error has been made and the one guy that doesn't is the referee and that isn't fair," said Poll. "I'm in favour of some technology. I would question whether we should give that power to the coaches or managers. "They could use this tactically. You see tennis players sometimes who are looking for an extra 30-second breather will put an objection in knowing the ball has gone out. "I think there should be other ways of reviewing situations." Poll took charge of more than 300 Premier League games and famously issued three yellow cards to the same player during a 2006 World Cup match. He added: "To my mind, there are plenty of good ex-referees who would be happy to sit there and review situations and help the referee. "They are completely independent and neutral, not at the whim of a television company providing the angle they choose. "The ultimate decision is with the referee on the field." Blatter will be standing for re-election next year as he bids for a fifth term in charge of world football's governing body and Poll hopes the idea of video challenges is not just aimed at winning votes. "I just hope this is not a pre-election promise because it is well overdue to bring technology in to help referees," said Poll. "It will help them and not undermine them."